Ram's promotional material includes photos with New Holland farm equipment. 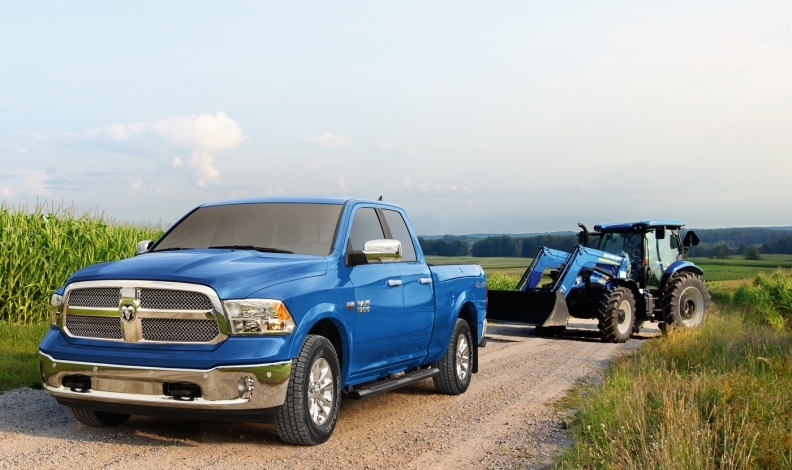 Canadian Ram dealers can now offer the country’s farmers Ram Harvest Edition pickups the automaker says are specifically designed for the agricultural market and come in colours that match their farm equipment. The Harvest Edition will be available across the Ram 1500, 2500 and 3500 lineup, in all four-door quad, crew and mega Cab configurations, all box lengths and all powertrains, including 5.7-litre HEMI V8, 6.4-litre HEMI V8 and 6.7-litre Cummins Turbo Diesel. Some equipment and options vary by model. 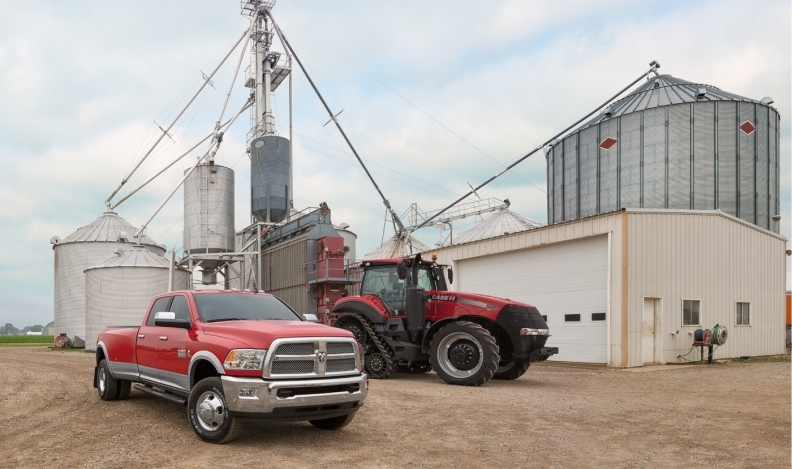 The Ram 1500, for example, has a ride-height increase of one inch and comes with off-road tires ”designed to help owners comfortably and confidently navigate rough farm roads and pastures.” Ram Heavy Duty models come with off-road tires and add a cargo-view camera. All Harvest Editions are equipped with tubular side steps, a spray-in bedliner, fold-out bumper step and mud flaps, rubber floor mats and skid plates. Heated front seats are available only on the Ram 2500 and 3500. The 4x4 version comes with tow hooks. Ram’s Uconnect 4C multimedia centre with 8.4-inch touchscreen, navigation, 4G Wi-Fi, Apple CarPlay and Android Auto are standard on all Harvest Editions. One unique feature” The Harvest Edition is available in Case IH Red and New Holland Blue paint so farmers can match their truck with their tractor. It’s also available in Bright White and Brilliant Black Crystal Pearl. An FCA spokesman said he couldn’t comment on why the truck isn’t available in John Deere Green. The Ram 1500 Harvest Edition starts at $48,285, including destination charge. The The Heavy Duty models start at $56,485, including destination charge. Ram Harvest Edition go on sale during the third quarter of 2017.